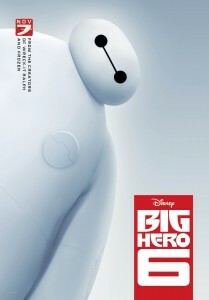 It’s a fast-paced movie with a cool super hero vibe, but the gentle giant Baymax really steals the show. Full of cute one-liners and great animation, it was an enjoyable way to spend a kid friendly 1.5 hours. I think maybe the sound effects and some of the bad guy stuff was a bit scary for smaller children – but each parent knows their kids and what they can handle. The movie never feels dark or super scary which is surprising for a movie based on Marvel comic characters! The futuristic location of San Fransokyo is definitely a place I could live, Disney did a great job of blending the two cities. Rotten tomatoes gives it an 88% fresh rating which I certainly agree with. It will appeal to both boys and girls alike as well! Katie @ Freckled Latte - Oooh, we can’t wait to see this one!! Glad to hear it was awesome.